"Be thou vulnerable," TED tells its speakers. But this famous speech was about vulnerability--in us and in the speaker. 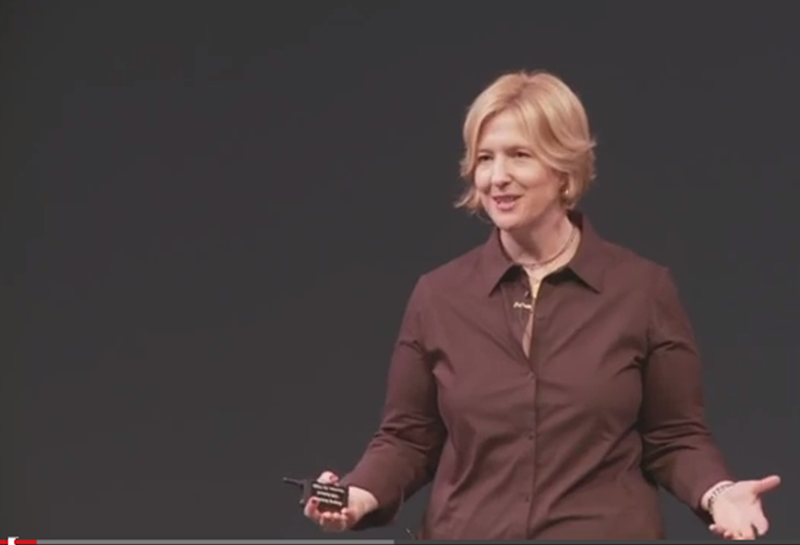 It must have struck a chord, because Brené Brown's 2010 TEDx talk on vulnerability is, as of late 2013, the fourth-most-watched TED talk of all time. I did this TEDxHouston talk in June of 2010 and then, in December of 2010, the talk was chosen to be on the main TED website and it went viral very quickly. And one of the things that happened during that experience for me, it was the most intense vulnerability I've ever experienced in my professional life....And that thing was an experiment, like, I never had — if someone would have told me that was going to happen, I would have never said the things I said. And my experiment was let me just try being vulnerable while talking about vulnerability. Let me see what that's like....There were parts of it that were very hard for me and that I felt very unprepared for. ...shame is really easily understood as the fear of disconnection: Is there something about me that, if other people know it or see it, that I won't be worthy of connection? The things I can tell you about it: it's universal; we all have it.The only people who don't experience shame have no capacity for human empathy or connection. No one wants to talk about it, and the less you talk about it the more you have it. What underpinned this shame, this "I'm not good enough," which we all know that feeling: "I'm not blank enough. I'm not thin enough, rich enough, beautiful enough, smart enough, promoted enough." The thing that underpinned this was excruciating vulnerability, this idea of, in order for connection to happen, we have to allow ourselves to be seen, really seen. And you know how I feel about vulnerability. I hate vulnerability. And so I thought, this is my chance to beat it back with my measuring stick. I'm going in, I'm going to figure this stuff out, I'm going to spend a year, I'm going to totally deconstruct shame, I'm going to understand how vulnerability works, and I'm going to outsmart it. The more esoteric your topic, the more concrete your language: Social work research into vulnerability is not everyday discussion fodder for most of us, and it feels and sounds "messy." So Brown uses simple, concrete terms throughout this talk. Of her own struggle with being vulnerable, she says, "For me, it was a yearlong street fight. It was a slugfest. Vulnerability pushed, I pushed back. I lost the fight, but probably won my life back." Define your terms in words I can recognize: Brown defines vulnerability for the audience in terms that reflect real feelings the audience can see and feel: "to let ourselves be seen, deeply seen, vulnerably seen; to love with our whole hearts, even though there's no guarantee...to practice gratitude and joy in those moments of terror...to say, 'I'm just so grateful, because to feel this vulnerable means I'm alive." In the process, she helps ensure that many in the audience will continue discussing the topic, having given them the words with which they can describe how it feels. Demonstrate your own subject: Sometimes, a speech gives you the opportunity to demonstrate, as well as talk about, your subject matter. I especially love the way Brown ends this talk with the very vulnerable statement, "That's all I have," the perfect embodiment of what she's been talking about. You can read the transcript of her On Being interview here and watch the video of her talk here (with a transcript) and below. Dive further into her research on vulnerability in Brown's books, The Gifts of Imperfection: Let Go of Who You Think You're Supposed to Be and Embrace Who You Are and Daring Greatly: How the Courage to Be Vulnerable Transforms the Way We Live, Love, Parent, and Lead . What do you think of this famous speech?